In 2045 the world is on the brink of chaos and collapse. With reality often too much to bear, people find salvation in the OASIS - an expansive virtual reality universe created by the brilliant and eccentric James Halliday (Mark Rylance). After Halliday dies, the world finds that he has left his immense fortune - and ultimate control of the OASIS - to the first person to find three keys and a digital Easter egg that he has hidden somewhere in his VR world, sparking a contest that grips the planet. When an unlikely young hero named Wade Watts (Tye Sheridan) decides to join the search, he is hurled into a breakneck, reality-bending treasure hunt through a fantastical universe of mystery, discovery and danger. 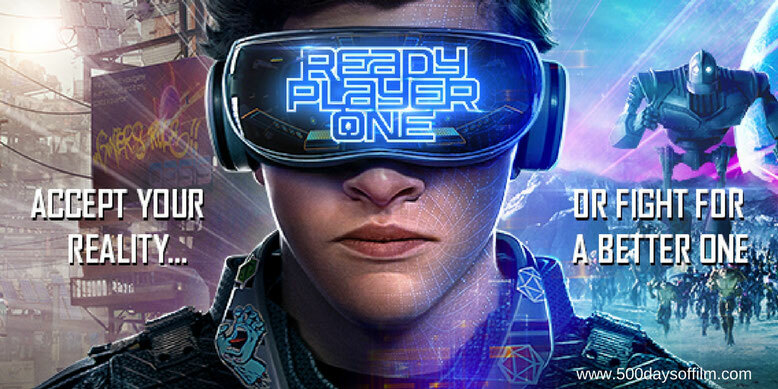 Ready Player One is a thrilling roller coaster ride through 80s pop culture - an exciting and visually stunning adventure that moves at exhilarating speed. In short, Steven Spielberg’s film made my geek heart soar (particularly during an incredible sequence taken from a classic 80s horror film - oh my goodness, what a moment of pure genius). I had such fun watching Spielberg’s adaptation of Ernest Cline’s bestselling novel that I found myself longing for a remote control. I wanted to pause certain scenes and take in all of the wonderful references (both visual and verbal). Ready Player One is most most definitely a film that will reward frequent rewatches. Crucially, Ready Player One works both inside and out of the OASIS. Indeed, one of the film’s strengths lies in its ability to cut from the (breathtaking) VR world to the brutal real world seamlessly and without breaking our engagement in the story. However, Ready Player One has not won over all audiences. Many who love Ernest Cline’s book lament the changes that have been made during the story’s transition from page to screen. I confess I haven’t read Cline’s book (yet… I do have a copy and am looking forward to reading it) and so I may not be best qualified to judge the success (or otherwise) of the adaptation. All I can report is that Ready Player One’s story certainly worked for me. However, Spielberg’s film is not perfect. For example, despite enjoyable performances from the cast, there is no classic Spielberg hero here - no Indiana Jones, Elliot or Chief Brody. As a result, I was not quite as invested in Ready Player One as I perhaps could have been. In addition, there are moments when the characters behave more like computer generated avatars than real people. For example, a character loses a loved one and then moves on with jarring (and pretty heartless) efficiency. Still, these are, for me, minor flaws. I loved Ready Player One - it is one hell of a ride and I cannot wait to watch it again. Spielberg spent four years making Ready Player One. Four. Years. He was working on his adaptation of Ernest Cline’s novel before Bridge Of Spies, before The BFG and, of course, before The Post (which he made while waiting for Industrial Light & Magic to work their, well, magic). Have you seen Ready Player One? If you have, what did you think of Steven Spielberg’s movie? Let me know in the comments section below or via Twitter (you can find me @500DaysOfFilm).